Buyers looking in the market for a new Android smartphone are inadvertently drawn towards devices which ship with Qualcomm’s processors. That being said, Taiwanese chipset manufacturer MediaTek has been making great strides to change that. And after two compelling mid-range processors in the form of the Helio P60 and Helio P70, the brand recently took to the stage and announced its latest chip in the form of the Helio P90. Expected to power smartphones retailing between Rs 25K to Rs 30K, MediaTek’s Helio P90 comes loaded to the brim with enticing AI features. I managed to get a closer look at the chip and its capabilities at an event held in Shenzhen and here’s what I make of it. 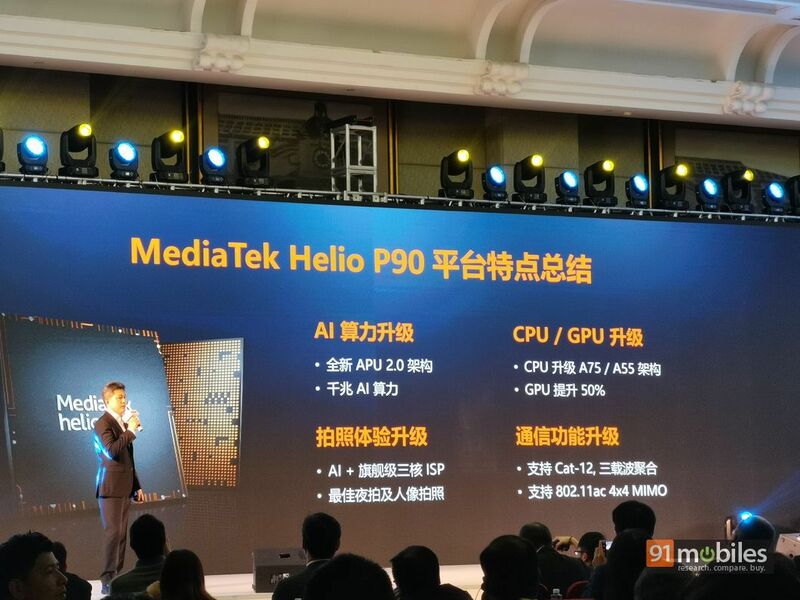 The MediaTek Helio P90 SoC boasts impressive performance to boot. So much so, a spokesperson from the company confirmed that the Helio P90 is currently the brand’s fastest mobile processor. In terms of specs, the Helio P90 ships with eight cores, two of which are ARM’s Cortex-A75 performance cores clocked at 2.2GHz while the other six are Cortex-A55 battery-efficient cores running at 2.0GHz. You might’ve seen the processing cores in a similarly outlined configuration in Qualcomm’s Snapdragon 670 processor and therefore, it’s safe to assume that MediaTek is targeting Qualcomm’s mid-tier chips with its latest. The graphics are handled by PowerVR GM 9446 GPU, which as per the company, has seen a performance increment of as much as 50 percent over the Helio P70’s GPU. This should work wonders for the chip’s gaming performance, as a more powerful GPU would be able to render graphically intensive titles like PUBG without any hiccups. What’s more, in GeekBench’s single and multi-core benchmark, the Helio P90 is claimed to offer a performance jump of 30 percent and 15 percent, respectively when compared with the brand’s Helio P70 chip. The Helio P90 has been manufactured using a 12nm process, which at first glance, might feel dated as compared to the competition’s 7nm and 10nm chips. However, MediaTek claims that not only does the chip boot faster AI performance (more on that later), but also offers a good battery life. To do so, the company has made use of its CorePilot technology which ensures that processing is done in the most efficient way across its cores. Consequently, smartphones powered with the Helio P90 silicon will be able to give buyers impressive performance over sustained loads without compromising on the battery life. 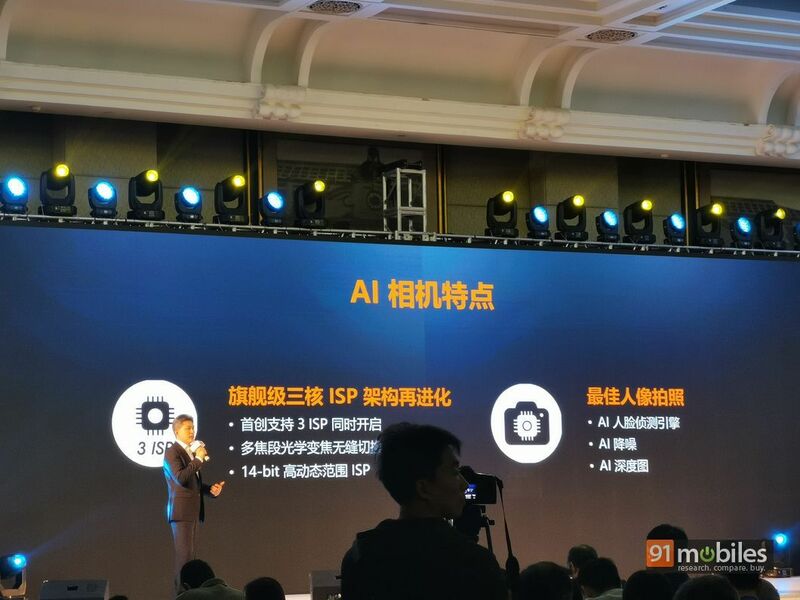 The biggest leap MediaTek’s Helio P90 chip offers over its predecessors and the competition is in the AI department. You see, the Helio P90 ships with a dual-core APU 2.0, which works alongside a built-in AI accelerator chip, ensuring that the unit can churn out 1,127 GMACs of AI compute. For the uninitiated, GMACs or Giga Multiply-Accumulate Operations per second is the term which is used to measure a chip’s AI processing power. 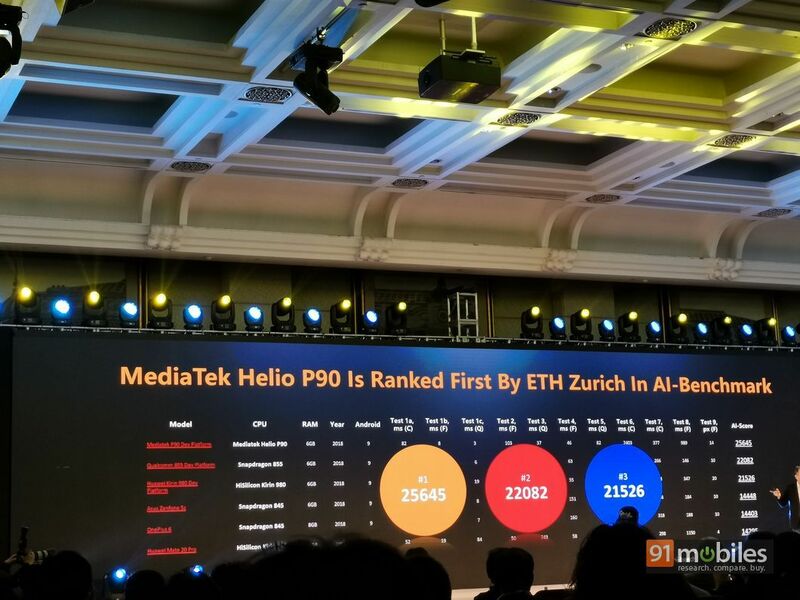 As per MediaTek, the Helio P90 is around 4.6 times faster than the Helio P60 and P70 processors in terms of AI processing, and it even beats flagship-class SoC’s like Qualcomm’s Snapdragon 845 and the Kirin 980 in various neural network tests like Inception V3, MobileNetV1 and ResNet-50. What’s more, the brand even showcased various use cases for the P90’s artificial intelligence prowess at the launch event, including an AI-based 3D human pose tracking system wherein, the processor was being used to analyse and transmit a performer’s dance over to a bunch of robots, which reciprocated the movements down to a tee. The Helio P90 chipset hopes to take photography experience to the next level by coupling AI smarts with powerful hardware. At the launch event, the company showcased various scenarios which benefitted greatly thanks to the artificial intelligence capabilities. For instance, a smartphone powered by MediaTek’s Helio P90 processor can take impressive low-light shots, enable live-bokeh in video mode, reduce the noise / blur in low light / moving shots and can recognise a face in the scene much faster than Apple’s A12 chip. The SoC can support a single 48MP sensor or a combination of 16MP+24MP sensors and can shoot super slow-mo videos at 480fps too. MediaTek’s Helio P90 ships with the latest 4G LTE WorldMode modem which features 4×4 MIMO and 256QAM, ensuring better and more stable coverage in densely populated areas. 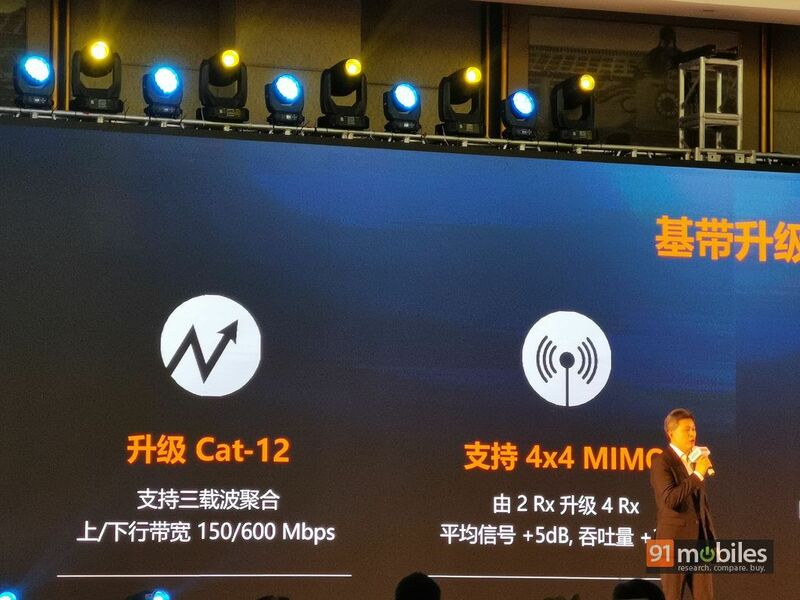 More importantly, the chip comes with support for Dual-4G, Dual-VoLTE for users who utilise two SIM cards at once. Of course, you get the support for usual options such as Wi-Fi ac and Bluetooth 5.0. It’s worth noting that Qualcomm has recently unveiled its 5G-capable Snapdragon 855 chip, but MediaTek’s Helio P90 doesn’t come with support for the next-gen network. However, the brand’s Head of Wireless Communication Product division TL Lee told 91mobiles that the company plans to launch a new chipset with a 5G modem at Mobile World Congress 2019. Having used the Realme U1 (review) which came powered by MediaTek’s P70 processor, I cannot help but get excited for the P90 SoC, which simply put, seems to offer a tremendous jump in terms of performance and AI capabilities. 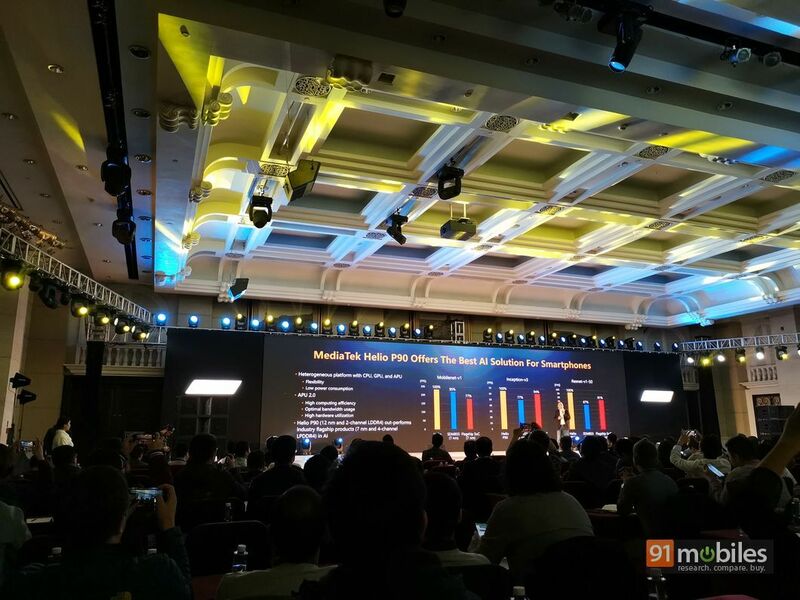 Having said that, MediaTek hasn’t divulged brands that’ll be launching P90-equipped handsets or even the price bracket in which these devices will retail at. In the end, it all boils down to how competitively priced smartphones fuelled by the Helio P90 SoC will be. If priced right, the P90 could very well make MediaTek a household name.